Acoustica is a cross-platform audio editing, mastering, and restoration application, including spectral editing, analysis, and multitrack capabilities. Ultimate Audio Quality – Acoustica offers support for state-of-the-art audio resolutions up to 32-bit and sampling rates up to 384 kHz, ensuring that all of your work comes across at the highest quality. Acoustica Premium Edition even supports multichannel audio recording and editing such as 5.1 and 7.1 surround sound. 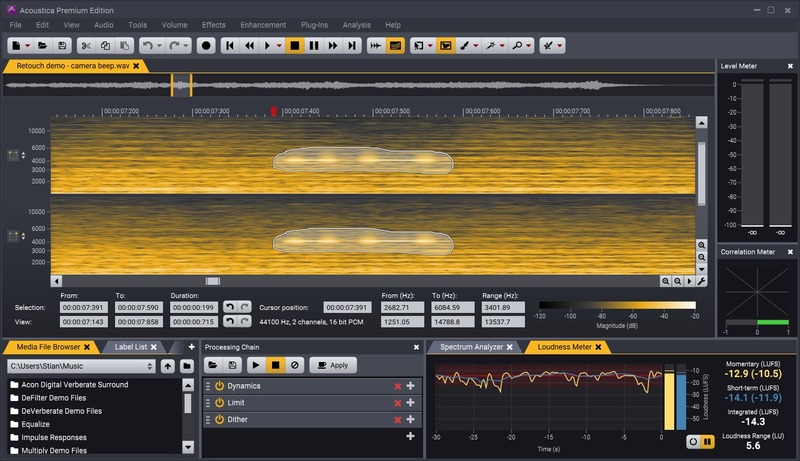 Audio Restoration – Integrated audio-restoration tools help you get the most out of recordings impaired by background noise, clicks, crackle, clipping, or missing high-frequency content. The Premium Edition contains the same set of professional tools as our Restoration Suite. Multitrack Editing – Mix audio from different tracks in real-time, insert audio effects, or create cross-fades easily in multitrack sessions. You can loop or time-stretch clips directly from the multitrack timeline, and automate volume, pan, and send levels. Processing Tools, Chains, and Plug-ins – High-quality processing tools ranging from a new suite of dynamic processing tools to EQ and effects such as reverb and chorus are integrated, along with sample-rate conversion, time-stretching, and pitch-shifting. You can create chains of audio processors, and apply or store them for later use. A powerful batch processor is included, and VST, VST3 and AU (Mac only) plug-ins are supported. Analysis Tools – Analysis tools such as spectrum, spectrogram, and wavelet analysis are available. Real-time analyzers visualize your audio output (EBU R-128 loudness, level, spectral, and phase correlation). Spectral Editing (Premium Edition only) – The new spectral-editing mode in Acoustica Premium Edition allows precise restoration work, since processing can be limited to isolated regions in time and frequency. Selection tools such as brush, freehand, and magic wand are available. The retouch tool removes noise based on a freely selectable reference from the surrounding audio. Next story VirtualHostX 8.3.0 – Host multiple websites on your Mac. Previous story iA Writer 5.1.3 – Professional writing suite.